Remember the 625W FirePSU we pictured at Sapphire's booth back at CeBIT in March? Well, back then we were told that Sapphire plans to introduce larger-capacity models that are better equipped to handle the load imposed by high-power graphics cards. If you've been waiting patiently for Sapphire's plans to turn into reality, you've hit the jackpot today as the Hong Kong-based manufacturer has launched not one but three new higher-capacity offerings. The existing 625W FirePSU will be re-branded to form part of Sapphire's PURE line of 80 Plus power supplies, and joining the 625W unit are larger capacity 950W, 1,050W and 1,250W models. For the enthusiast planning a beast of a build, Sapphire's 1,050W and 1,250W PURE power supplies come in rated at 80 Plus Silver and 80 Plus Bronze, respectively. For those hoping for something a little less extreme, the PURE 950W is 80 Plus Silver-certified and promises to be "positioned at a price level to compete with power supplies that have much lower specifications". Though, we'll have to wait for real-world pricing to see how competitive Sapphire's figures really are. All four PURE-series PSUs come with a modular cable system, aluminium capacitors, and a 13.5cm white-LED ball-bearing fan that'll run at user-controlled speeds ranging from 450RPM to 2,000RPM. No word on availability just yet, but Sapphire's complete specification for the three new models can be found below. 21 QOTW: What wattage is your power supply? Are they manufacturing these themselves or using an OEM like Corsair do with Seasonic and CWT? Why do modular designs have so many connected cabels. My Zalman ZM-850 is modular design but has 4 SATA cables, 2 x 8 pin GPU cables among the usual power connectors. I would like to see design with only the motherboard power cables. 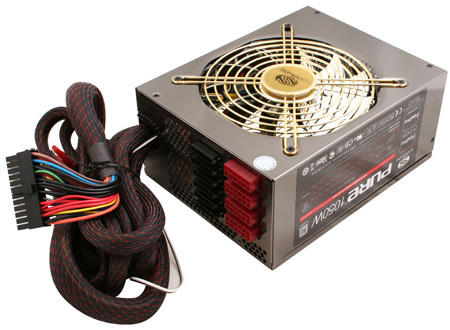 I would want a modular PSU to be completely modular, including the motherboard cable. I would also expect to be able to buy accessory cables fairly easily, so you could buy an extra long mobo cable, or an extra short one. This would make a lot of systems far more organised and far far neater.